I’ve made one batch of these from my mother’s recipe, I made a few mistakes but they were still delicious. Rub the butter into the flour and baking powder. Mix with the beaten egg and add milk a little at a time until you have a lump of dough. Roll it out into a long strip, at least 11in long and 8in wide. Cream the butter, sugar, and cinnamon together. Spread across the dough in a thin layer. Roll up the dough on the long side and seal the edge with a little milk. Cut into slices and put in a foil-lined 8×8 dish. Bake for 20 mins, you should see the filling melt and bubble. 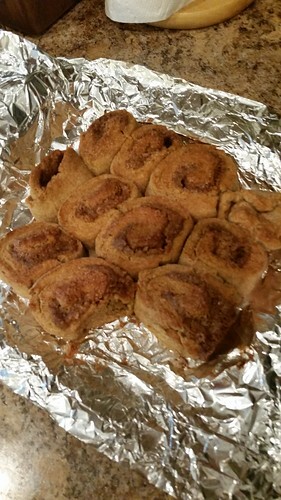 My big mistakes were that I didn’t roll the dough out thinly enough, and I didn’t spread the filling over the whole width of the dough, so some parts of my buns are missing cinnamon filling. But they still taste delicious. Batch #2 will be cooked at 450f to see if that gets the sugar all melty, and double the cinnamon in the filling.